Arrival in Luang Prabang. Formalities, reception and transfer to the hotel. Visit of the city beginning with the Wat Visoun temple built in 1513, the oldest temple of the city, inspired by a Khmer temple in the south of the country makes its singularity, then visit the temples of Wat Mai dating from the late eighteenth century, the temple of Wat Aharm. 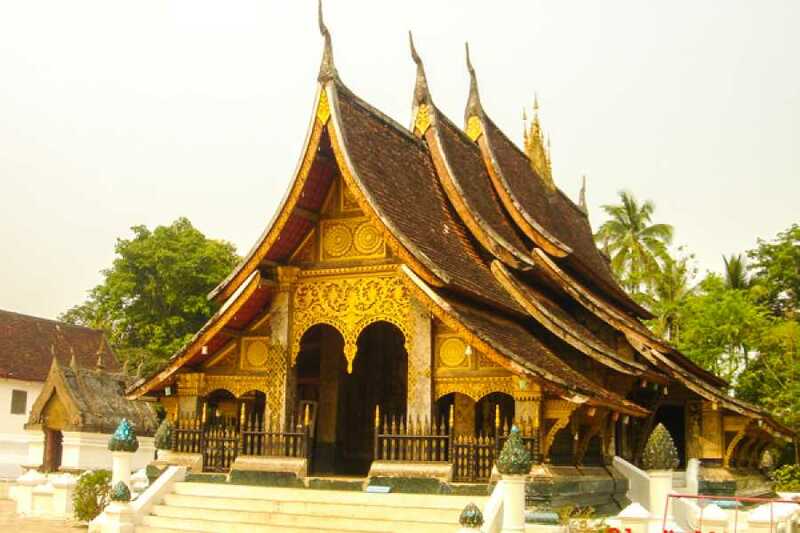 Discovery of the Royal Palace (closed on Tuesday), today converted into a National Museum where you will admire the Prabang, golden Buddha who gave his name to the city, the attributes of royal power, bronze drums. For the evening, walk around the night market. Lunch, dinner and overnight in Luang Prabang. Breakfast in the hotel. Departure for a boat trip on the Mekong to the sacred cave of Pak Ou, home to a hundred statues of Buddhas gilded wood. Stop at Baan Xang Hai Village and visit a traditional sticky rice liquor distillery. Continuation the path, which will lead you to the falls of Kuang Si, beautiful succession of waterfalls in an enchanting site. These places are frequented by the inhabitants of the city and the tourists. Lunch, dinner and overnight in Luang Prabang.